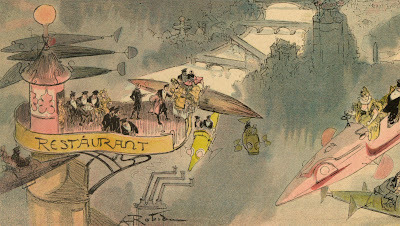 This lithograph from 1882 depicts the fanciful world of 2000; flying buses, towering restaurants, and of course, 1880's French attire. 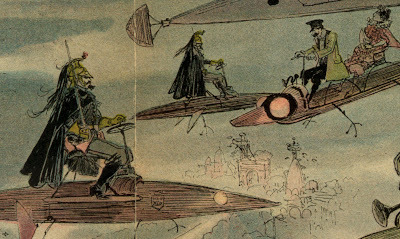 Albert Robida is less well-known than Jules Verne but contributed just as much to the collective imagination through his amazing illustrations. 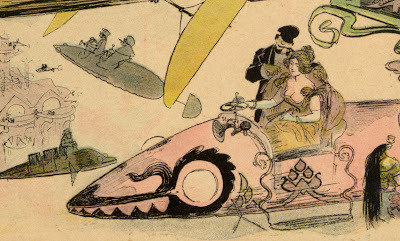 If you speak French I recommend picking up the Robida book La vie électrique. For the record, I don't speak French. Much like a child, I got it for the pictures. Funny how much this reminds me of a lot of Syd Mead paintings: (Presumably) rich people dressed up and going out on the town in their flying cars. 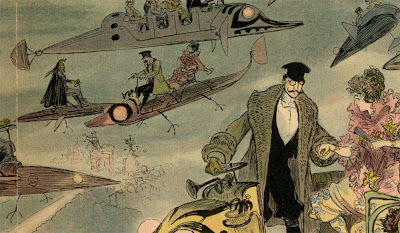 Beyond the clothing, the other startling anachronistic aspect (paleo-futuranachronistic?) is the absence of features to protect passengers from weather -- no windshields, no doors, no tops or coverings. It's odd because even buggies and carriages of the era would have had a top or canopy of some kind (sometimes retractable). I'd be willing to bet his research department saw these prints or something similar. I will have to agree to the probability that this is from a later date. Certain aspects of the aerocars specifically mimic aspects of very late 1890s and very early 1900 Renault designs, which I just cant see occuring three years before the Benz brothers came up with their first internal combustion trike-car. La vie électrique was published in 1892. The horns we see in the image have air bulbs attached. They are not klaxons (a trade name) which were electromagnetic devices. 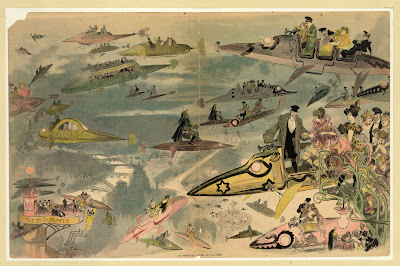 I love Albert Robida's work! 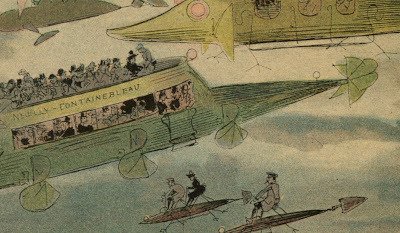 Notice how they resemble Albert Robida's flying machine. Oh, it's definitely the source of much of the design concept for "Howl's Moving Castle" -- a wonderful film and amazing visualization of the Diana Wynne Jones novel! 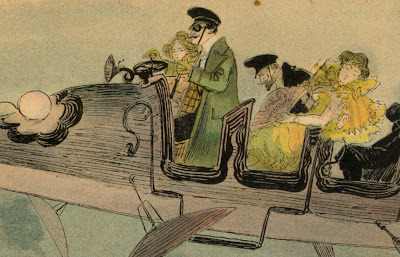 I love Albert Robida's work. One of the university presses recently printed the first English edition of one of his novels (with all the illustrations) that was just amazing. Thank god the monocle never went out of style. What a prediction, people actually flocking to an opera in 2000. Unless it's prefixed by "Phantom" then that's hilarious. I wonder if our conceptions of the future will look dumb in a few decades, or have we all gotten better at it?